The Balance sheet of Life. I am sitting on a bench facing the small patch of land by the river. On my right there are two others who are Japanese and another European man. On the bench facing the river there are couple of other Japanese and an Indian talking to a European lady about languages. There were more people on the three benches that formed a small gallery. In front of us a man wrapped in white clothes and clean shaven head walks to the fire, stops and drops few herbs into it. The near by man, a doms, handed over a long bamboo stick and the man wrapped in white clothes took it and touches something hollow three times. I could hear the thud sound thrice. As he handed over the bamboo and walked away, muscles on my face tightened, I didn’t blink. I looked at the man sitting next to me, he didn’t blink either and I could see that his face muscles are tightened just like mine & the fire nearby is reflected in his eyes. Suddenly dogs started howling, it got louder and become so loud that for a moment I thought its pre-recorded sounds played in a loud speaker. But it wasn’t it. It died out just like it started. 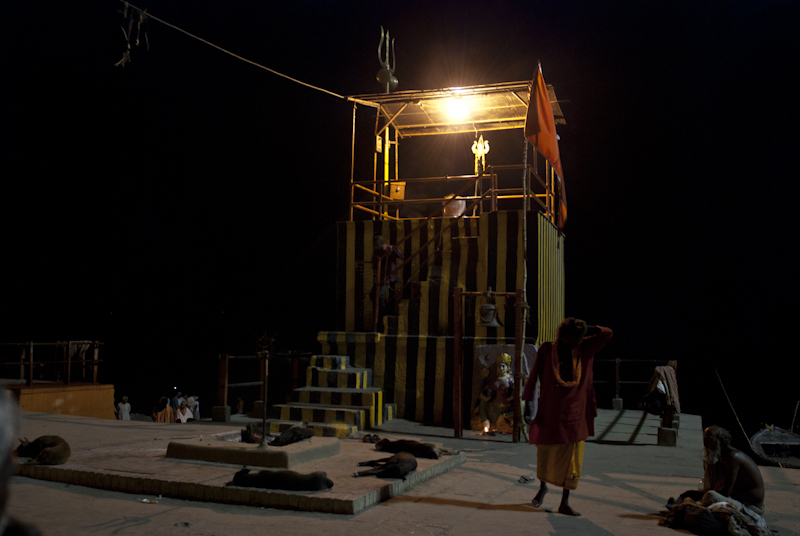 Harischandra Ghat, Banaras, 2012 April 29. 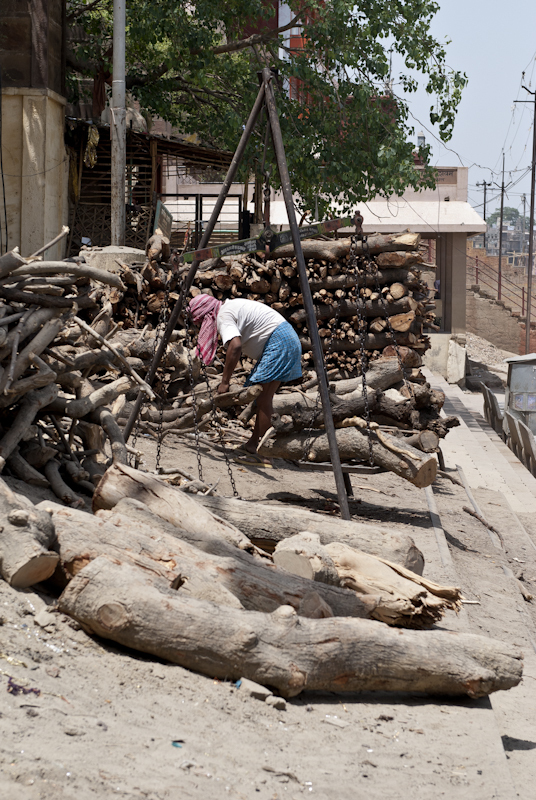 There are few more fires burning by Ganges and the care takers are reshuffling the wood to help the fire. They use the long bamboo sticks and moved around woods using two smaller bamboo sticks as if they are tongs. A small boy of perhaps 3 years of age is playing nearby, may be the younger brother of the boy who is looking after the fire. Power came back and the area is now lightened up with the sodium vapor lamps. 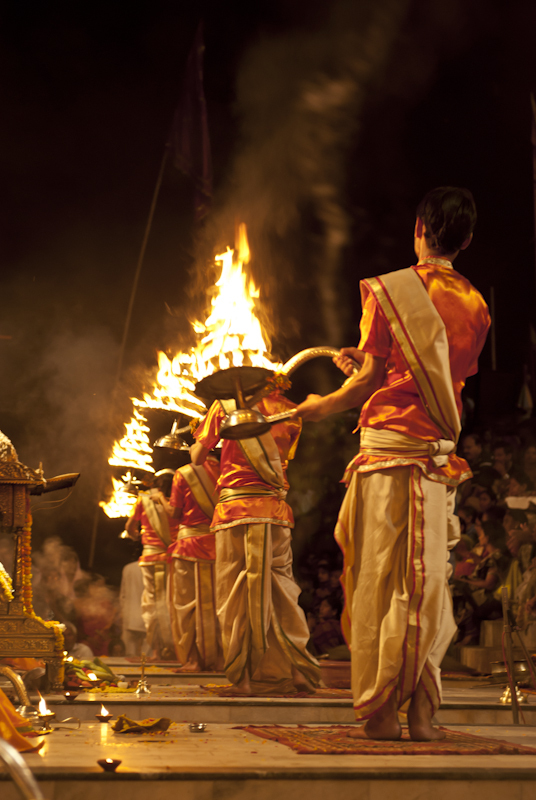 I could see men sitting little far from the fires and a new set of people arrived soothing the loud silence with “Ram nam satya hai” and went closer to the river. There were hardly any women around. I am sitting facing a small building and I knew that there are more benches on the other side of it. I started walking there, still looking at the fires. 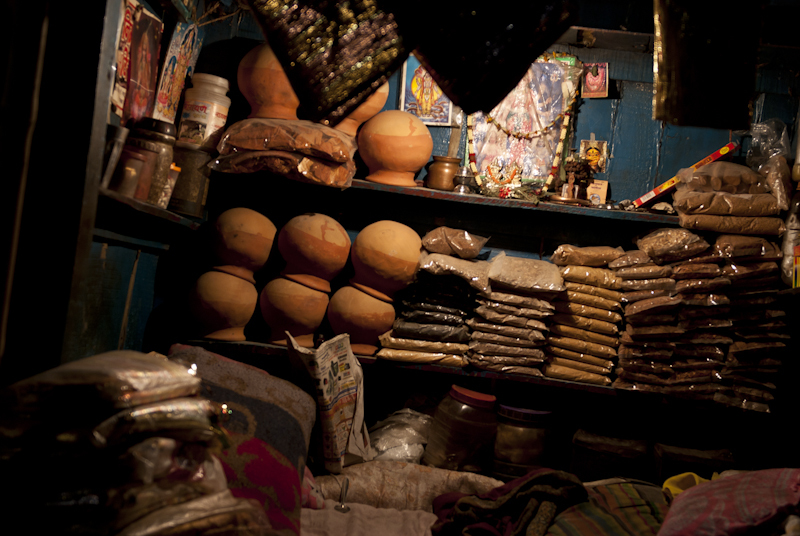 I walked past a small shop selling some sort of powders, perhaps sandal wood, earthen pots to collect the ashes and heaps of wood for the fire. Few kids were playing cricket with a small piece of wood and they are confused as the ball just gone missing. I was about to sit on one of the benches next to an old man and a sadhu that someone came hassling and settled there. I sat down on the floor next to the bench. 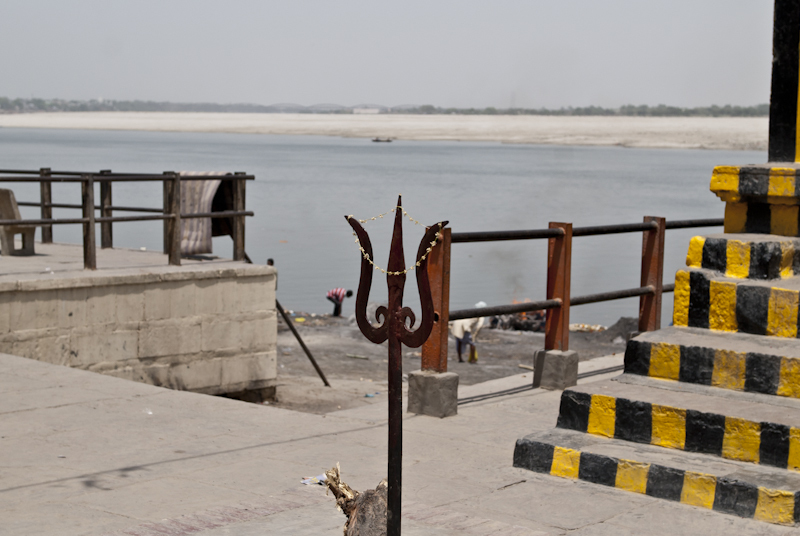 There is yet another small construction – a small temple and a Trishul with a small fire burning next to it. In front me a dog is sharing the rugs with a sadhu who is busy powdering something with a stone. There were just a handful dogs and all were merrily wandering around apart from the one which is leisurely relaxing on the rugs. The old man sitting on the bench in front me turned around and asked “boat ?” and I said something in Hindi and now the man asks in Hindi, “Nau chahiye kya ?” I said, “nahi bhayya” and he leaves me alone. I sat there just being myself and still wondering where am I or rather what am I. It was peaceful and my thoughts about on going business meetings vanished, the outcomes didn’t bothered anymore. I thought about the day passed where I was thinking about a project proposal, it was funny, holed up in the most ancient city on the planet and thinking about a project where objectives were not clear, the past months, past years, the years that gone by which has placed me here, the times when I had to stop every three steps to mend straps of the sandal & back to present when I carry the most expensive and sophisticated gadgets available. About thousands people whom I have met over the years, many with whom there is no contact anymore. Well, what’s there in balance sheet now ? Nothing very impressive but I knew it didn’t matter. The so called cheap chappal which lasts for 3 steps or the gadget which drains every three hours, everything is pretty much the same. The profitability of a life cannot be measured in what is left behind for one leaves few memories in the hearts of others to fade away. There is nothing else. Nothing else matters. A sadhu turned around and looked at me, I tried to smile at him, he didn’t respond at all. He stood up and walked to the temple, walks around a bit and settles back to his place on the bench. 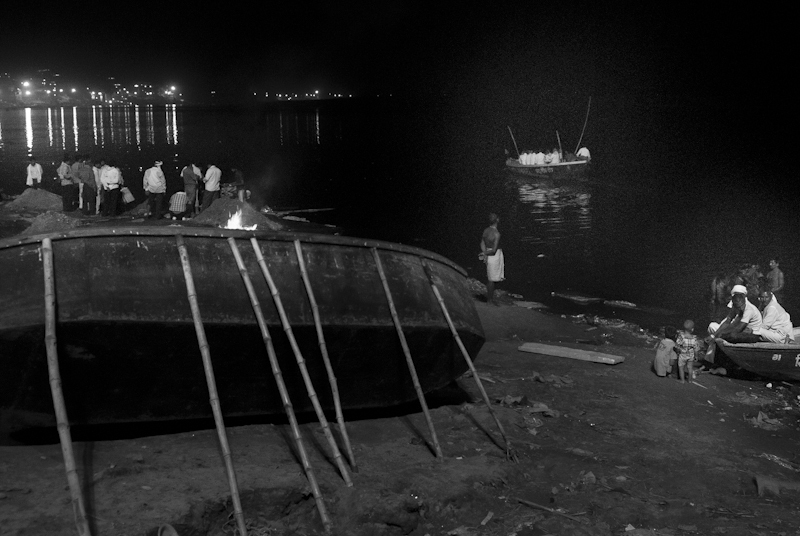 A family arrives and they wants to go for a boat ride to see the Ganga Aarathi. 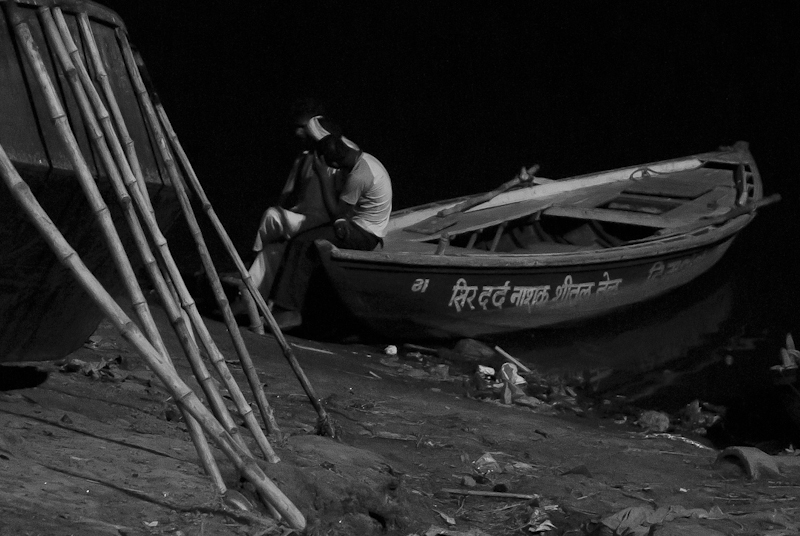 The idea of starting a boat ride from a place which puts ‘the end’ amuses me and I followed them to the Ganges. Few boatmen approaches them and they started bargain with them. The fire beside them casted dancing shadows on the men and women. Another boat man approaches me, unsure of my origin, he talks to me in some foreign language which I don’t understand, I ask him “aap kaham sai hai?” .. “Hum tho Banarasi hai” he replies. We talk about the boats, who owns the boats etc and I told him that I am trying to be with myself for now, he looks into my eyes, we both understands each other and he walks away. 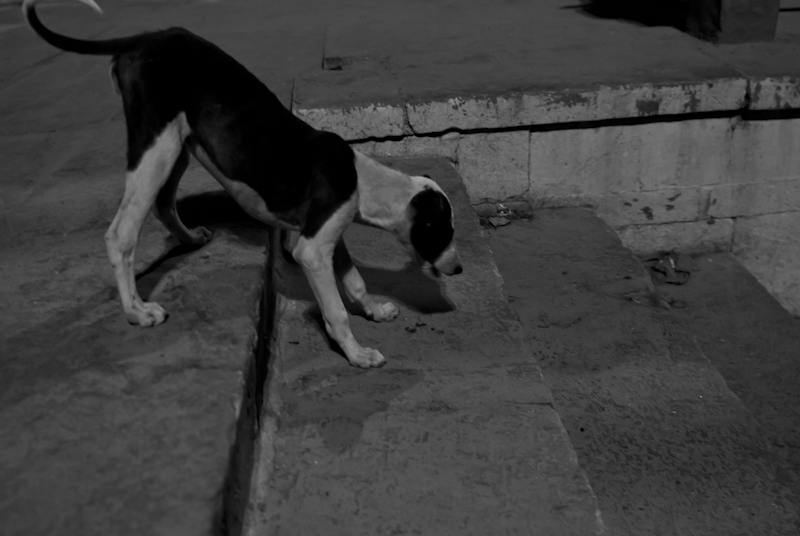 A medium sized beetle falls on the floor, split of a second a small dog rushes and savours it. Might be a lucky one to die here ! On far right lights from the buildings reflected in the still waters of Ganges the breeze fills me with the remains of the fire. The family manages a profitable bargain and sails away towards Dashashwamedh Ghat. A profitable bargain ! What’s profit ? The traditional wisdom defines it as sums in a P & L statement. What’s mine ? Numbers from few complicated excel spreadsheets appeared in memory, not so bad they were. A small, glittering cloth fluttered in front me. 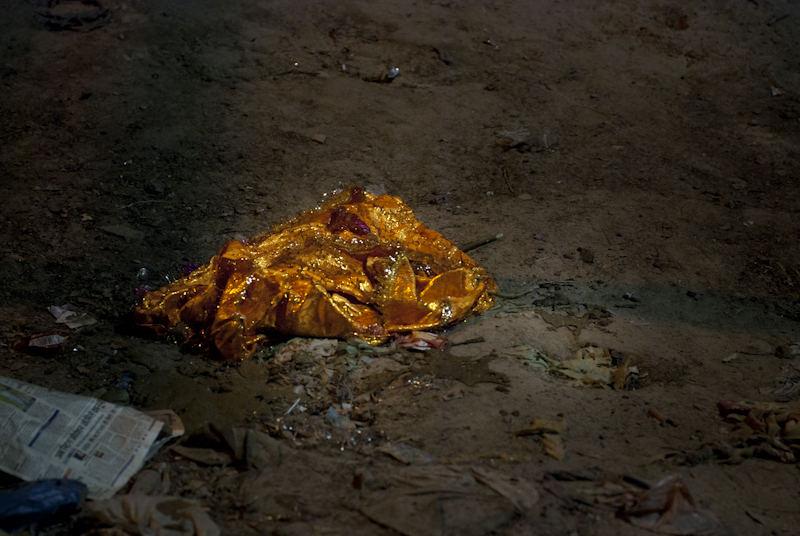 The orange coloured cloths are available in the shops where they sell powders and earth pots, this is the same cloth left behind by someone, I felt quite uncomfortable about the double meaning, the pun, a balance sheet here. Few men and women are sitting near are me silently staring into the fire infront of them. For a moment I had the urge to throw away the bag, the shirt I had which is already half unbuttoned to survive the heat. I stood up, picked up my bag and camera and started walking. I was feeling peaceful, a sense of satisfaction. As I was strolling yet another sadhu started into my eyes, an intense, piercing look and he made sure his eyes are locked with mine by slowly moving his expressionless face still working on powdering the dry leaves of salvation in his hands. I didn’t blink, kept on the stare and smiled at him. 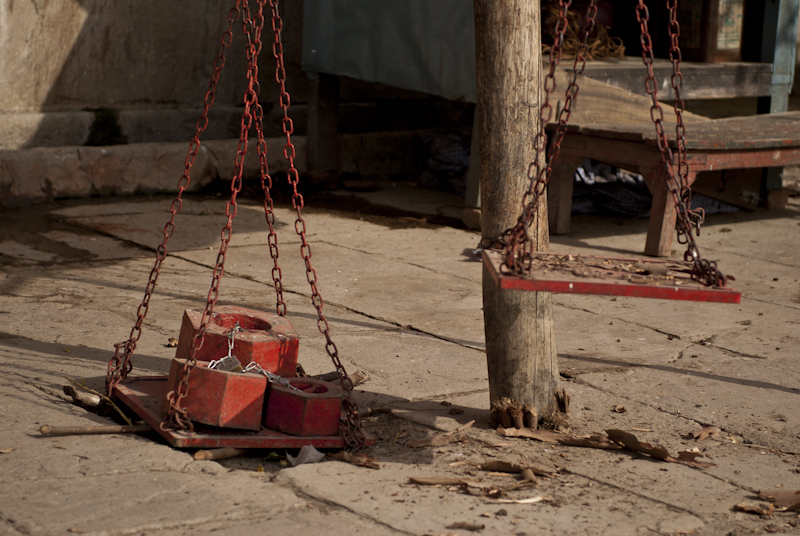 I walked past the scales where they measure the profitability of life, groups of men, dogs, cows, people on the benches near the fires, children playing by the fire. I knew I will have to return, because this is where we all belong, I knew that this is very easy to sell a Ferrari and become a monk but thats being incompetent, I still need to fill the cells of my balance sheet which exists in the souls of the people around me and become a monk owning a Ferrari or more. 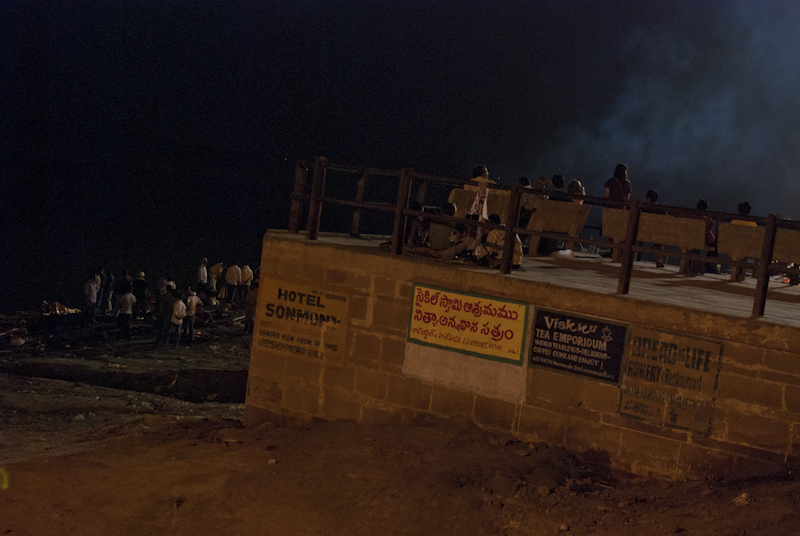 I sat down after crossing few more ghats and went back to the hotel room after a while. Later I went back to Delhi, finished of yet another meeting, lost the project for which I was there. But the journey adds a whole new dimension to life and a better understanding of everything around us. I am thankful to my folks @ Agileblaze, my family, friends, people who made these journeys possible & to the almighty to help me walk the path of enlightenment and teaching what really matters. I am back home, busy filling my balance sheet.